Spectacular 5 star Sanur Hotel is located on the sandy beach of the East Coast of Bali. It is the perfect gateway for those who seek to explore Bali, the famed island of the gods and their friendly people, known for its colorful and vibrant temple festivals, sun- drenched beaches, constant surf, rustic villages and sculptured rice terraces. The surf lessons are taught at the baby reef in front of the hotel. There is different kinds of reefs for all abilities. The clients get taken by boat to the outer reefs and are provided with helmets, surf boards, and reef booties. If conditions are not good then there will be no alternative than to drive you somewhere else in search for the surf spot with the ideal conditions for Beginners or Intermediates surfers. This could mean end up in the beach of Legian, Kuta, or Canggu. The Yoga studio is 50 metres from the hotel and offers a range of classes to suit all levels of competency from beginners to teachers. Eco- friendly and 100% Bamboo. We have classes every day both morning and in the evening so you can chose when to do the class. This spectacular 5 star Sanur Hotel is located on the sandy beach of the East Coast of Bali. 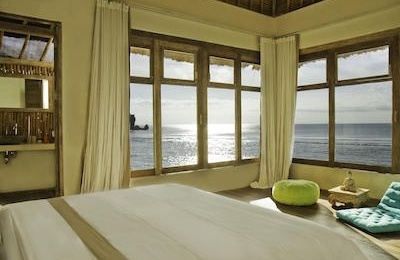 Only about 20 kilometers from Bali’s Ngurah Rai Denpasar International Airport and 5 km from the city center. 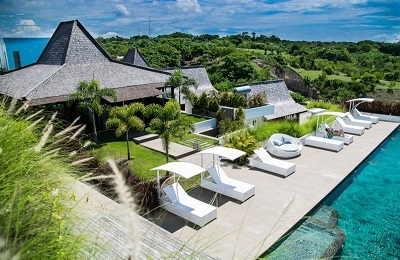 It offers easy access to the city’s must-see destinations and ideally connected by a new toll road across the Benoa bay. It is the perfect gateway for those who seek to explore Bali, the famed island of the gods and their friendly people, known for its colorful and vibrant temple festivals, sun- drenched beaches, constant surf, rustic villages and sculptured rice terraces. There is a free Shuttle that takes you all day every day to Sanur centre. Two swimming pools with newly built water slides and young children pool. Surrounded by the lush tropical garden, the family leisure pool is the perfect place to relax under the sun while viewing the beauty of the nature and letting the kids have a blast in the clear blue water. This colorful pool area offers a safe, supervised and healthy environment for children to swim and play to their heart’s content, equipped with slides, water playground, sails to provide shade, wooden deck and cabanas. Huge indoor playroom, clean, and full of toys. A complete relaxing spa experience. Immerse yourself in the world of handmade and organic spa with no chemicals. The coconut scrub, for example, is grated directly from coconut shells, taken straight to the treatment room and applied to your skin. Spa center offers massage, body scrub, manicure, pedicure, facial treatment, foot reflexology, and more. Unfolding onto 700 meters of white sand on Mertasari beach, Bamboo Bar & Lounge is set to become the coolest hangout in Sanur. The charming new bamboo pavilion boasts soaring ceilings, uninterrupted sea views and special design effects, including funky bamboo chandeliers by famed Indonesian stainless steel artist Pintor Sirait. There is a new beautiful Bamboo restaurant on the beach with a real Pizza oven. Fitness centre equipped with state-of-the-art facilities, a wide range of amenities and highly trained staffs. Now with new and updated lighting, carpet, paint and graphic wall coverings, parquet wood floors in the aerobics room and two private sauna rooms for him/her; complete with lockers, changing rooms and shower facilities. The Surf guides will decide which surf spot to go each day after evaluating the swell and wind conditions and taking into consideration the clients’ surfing skills. The surf guide’s main objective is that everyone surfs great waves although obviously, we will stay around our area if the conditions are good. If there is guests with different surf levels they will be taken to different surf spots in different vehicles. The surf guiding will consist of one good surf session per day. Surf spots you might be taken to could be Cucukan, Keramas, Ketewel, KFC, Serangan, and a few other secret spots. All great right handers. For those goofy footers don’t worry, there is also a few left handers on the east coast. The surf guiding might be by land or by speed boat to the outer reefs depending on the conditions. There is at least 5 waves out the front including the famous Serangan only 7-minute boat ride. The surf lessons are taught at the baby reef in front of the hotel. There is different kinds of reefs for all abilities. The clients get taken by boat to the outer reefs and are provided with helmets, surf boards, and reef booties. If conditions are not good then there will be no alternative than to drive you somewhere else in the search for the surf spot with the ideal conditions for Beginners or Intermediates surfers. This could mean end up in the beach of Legian, Kuta, or Canggu where most surf camps and surf schools in Bali pile up. The Surf lessons are 2 hours each and usually semi private and in small groups but if we end up in Legian there will be normal size groups like all other surf schools. Intermediate 3: Surf trip – beach/reef breaks. Put your skills to the test, graduate on challenging waves. Introduction to Short boards: Takes you to the next level. Understand and control short boards, duck dives, selecting waves, timing, take off. 200-hour intensive Vinyasa Flow Teacher training. Ask us for more information. Traveling with a valid travel health insurance is highly recommended. Ngurah Rai International Airport also referred as Denpasar International Airport is the main airport of the Island. Seasonal direct flights available from Auckland and are operated by Air New Zealand. Direct flights are available form Amsterdam by KLM and St. Petersburg by Rossiya Airlines. Also try to search for flights to Jakarta and then take a quick domestic flight to Bali. Being a popular resort nestled alongside the Mertasari Beach in Sanur, Bali, it is easily accessible from Denpasar, Kuta, and the Ngurah Rai International Airport. Garuda Airlines, the official Indonesian carrier, has direct flights to Bali from Singapore, Japan, Korea, China, Australia and New Zealand, while also serving many cities within Indonesia. There is a free Shuttle that takes you all day every day to Sanur center. This package is for those surfers wanting to surf reefs and discover new waves on the uncrowded East Coast of Bali. Our Surf Guide in Bali will show you its best waves. It will be like going surfing with your mates back home. * Packages with less days or more days also available. * Rates include 21% tax and service charge. This is a surf school package for beginners, 1st timers or Intermediate surfers who want some more coaching and improve. *Packages with less days or more days also available. *Rates include 21% tax and service charge. 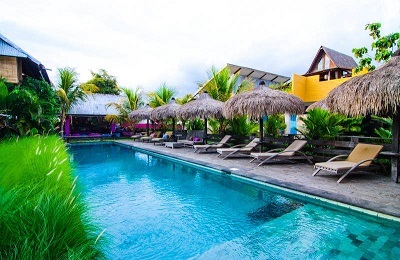 This surf and Yoga Retreat is a package with daily Yoga sessions combined with surf lessons in front of the hotel or Surf Guiding to best surf spots on the East coast of Bali. Total beginners welcome. Available all year! "We just spend 7 days at The Sanur Hotel and had a wonderful time. Resort is right in the beach with a great kids pool with slides. Awesome beach bar and Italian restaurant. We are a family with 2 children. The staff we're helpful and friendly. Will definitely visit again." "Stayed at The Sanur Beach hotel in December 2015. Booked two interconnecting rooms as my children are 13 & 16. This worked well and the rooms were spacious & comfortable. Breakfast excellent with lots of variety, staff friendly & location right on the beach is fantastic. Would stay again."